At 870 pages, this is a very long book. It takes a dedicated child reader to finish, but Rowling seems to draw those in abundance. Needless to say, the book covers a lot of ground. Within, the home of Sirius Black has become headquarters for those who believe Voldemort is back and are working to oppose him. These dedicated folks call themselves the Order of the Phoenix. The Ministry of Magic, however, at the control of Cornelius Fudge, has taken a firm public stance against Dumbledore’s warning about the Dark Lord’s return. Fudge plants Dolores Umbridge (I really hate her!) at the school and gives her more and more authority. Under her headship, Hogwarts resembles a communist regime. Harry gets banned from Quidditch for life, and physical punishments get rather harsh. Students are even forbidden to practice defensive spells, as Fudge holds the irrational fear that Dumbledore is training an army to overthrow him. Harry, Ron and Hermione, however, take matters into their own hands. Meanwhile, the connection between Harry and Voldemort via Harry’s scar has become more pronounced. Harry dreams he is Voldemort, and when he wakes, the dreams have become reality. But the Dark Lord, too, has become aware of the connection and uses it to manipulate Harry into a trap. Deep within the bowels of the Ministry of Magic, a dozen or so Death Eaters and Harry and his five friends face off in the fight of their lives. In the end, we find out why Voldemort chose to target Harry in the first place, why they continue to cross wands, and what final desperate conclusion they are destined to reach. This time around, I have to comment on the realistic feeling of institution in these books. 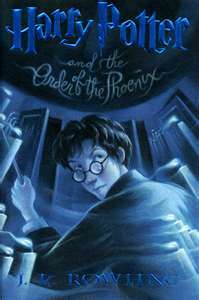 In this, Harry’s fifth year, he and his classmates must take their OWL (ordinary wizarding level) exams. To continue to NEWT (Nastily Exhausting Wizarding Test–seventh year) level studies, the OWL score in a particular subject must be at least an E (exceeds expectations) or an O (outstanding). After their OWLS, students discuss their career options and course choices with their House advisors. This hierarchy of magical difficulty gives Hogwarts academics and the whole wizard economy a feeling of authenticity. I also have to mention broomsticks. Quidditch is to the wizard world what soccer is to the UK. Everyone has posters of their favorite teams, and everyone plays pick-up games in their backyard (provided they’re safely away from Muggle eyes). And everyone owns a broom. There’s the Cleansweep series, the old Comets, the Shooting Star, the safe and reliable Bluebottle designed for family use, and the Silver Arrow. Harry owned a top-of-the-line Nimbus 2000 until it was pulverized by the Whomping Willow. He then received a world-class Firebolt (which, incidentally, was used by both the Bulgarian and Irish teams in the 1994 Quidditch World Cup match). If you look on the web, you’ll find pages and pages about the history and manufacturers of brooms throughout the wizarding ages. What a hoot! And what I wouldn’t give to kick off and take a spin around a Quidditch pitch. There are a few negative elements that warrant attention. As is common in the series, Order Of The Phoenix contains a few minor profanities. Also, at one point Voldemort attempts to possess Harry, but he’s repulsed by Harry’s goodness. Prophecies delivered by seers in a trans-like state are spoken in deep, harsh voices. There’s a lot of rule-breaking going on, and Harry, after suffering a tragic loss, goes off the deep end and lambasts Professor Dumbledore with insupportable disrespect. Despite all this, I still think all twelve-year-olds should have the opportunity to visit Hogwarts. It’s a journey into imagination and fun unlike any they’ve ever taken. Next Indie Endeavors, Part 5 – What the Heck is an ISBN? Excellent review of a difficult book, Michelle. I love to learn new words! Great review! It’s the longest HP book, but I’ve seen kids (and adults too) glued into the story. It’s really magical what J.K.Rowling does. (Yes, I meant to use magical.) I think this is really when everything turns dark and serious. Unfortunately, I think the movie was poorly done. I look forward to your review of The Half Blood Prince. That one may take a while in coming. I reread all the HP books last fall with my daughter – through number 5. Then my daughter got addicted to the Warriors series and dropped Harry. I mean to finish the series again without her, but I’ve been too busy with my own new book to take the time. It’s on my spring to be read list, (along with about fifty other titles! ).